Oh, Stephanie! Thank you so much for your kind words and loving encouragement. Thank you for giving your sweet Mom a hug for me. You are both very dear to my heart. Sending much love back to you! Cheryl, I literally had tears streaming down my face as I read this post. Isn’t it amazing how our mindsets change as we get older. I grew up in a medium income household, but my parents lived very frugally. My dad is still living in the house where I grew up. He has no desire for earthly things, but has laid up treasures in heaven. I love your writing, dear friend. It always makes me ponder. I didn’t see a place to comment on. No Sidebar. Yes, my friend, it surely is amazing how much we change. That is so sweet that your Dad still lives in that same house. Oh, the memories that must live behind those walls! I don't think there is a place to comment on No Sidebar, so I thank you so much for taking the time to come back here and leave such sweet encouragement. Much love to you. I just read your article and had tears running down my face through a lot of it. What a blessing you are to so many. Thank you for having such a servants heart and sharing the lessons you have learned. I am praying for you and your sweet family as you pursue this dream, by living in faith in Him. Oh, Betsy! How very kind and dear you are! Thank you from the bottom of my heart for your sweet words and love and friendship. Your prayers mean more to us than you will ever know. I LOVE how you worded that ~ that is truly what this is—living by faith in Him. I have sang that song for years about "Living By Faith," but truly am only now understanding its full meaning. I sometimes wonder if we will ever fully exhaust exploring the many levels of trusting God while still living in this life. Sending much love and many blessings to you, dear friend. How lovely to read the 'old' values that I grew up with. No such thing as a credit card, one saved ones pocket money until one had enough for the dress. the toy , the bike etc. The main thing I learned was never to waste anything, to make things go twice as far as you think they can, and to enjoy what you have without yearning for more. You are so right, Elizabeth. I, too, learned never to waste anything. To this day, I cannot do that and try to use up things and be content. I am so grateful for your kind words and sweet visit. I hope all is well with you, my friend. Dear Cheryl, you experiences and life lessons are so valuable to your readers and you are thanked by all of us for what you are sharing. I appreciate your kind words and support, sweet friend. God bless you abundantly! Aw, BJ! What a precious, sweet story! Your Mama sounds like one dear lady. I am so glad you got to tell her that ~ it must have meant the world to her. Thank you so much for sharing with us. Such a beautifully written posting about your simple life growing up. I read this with tears in my eyes and chills running up my back because it is real life! You are so very right about our way of thinking changing as we grow older, I have come to that place myself, though I could still make a few more changes. I think as women we feel that we need to make our nest perfect with "things" from the onset of our marriage, when really that does not have to be the case. My mother lived her married life with plenty, but she has certainly changed since the passing of my dad and is now living alone in a very simple, yet lovely home. She doesn't want all that "STUFF" in her life now. She too has come to a place in her life where heaven bound is more important. I appreciate what you have shared with us, and I will certainly ponder on it and put into action your helpful tips as the Lord leads and directs. Thank you so much, Debbie. Your mother sounds so sweet. It surely does seem like Heaven's pull becomes steadily stronger than the pull of this world, the older we get. It reminds me of that song, "Until Then" where it says, "The things of earth grow dim and lose their value, if we recall they're only borrowed for a while..." I often hear dear Zach praying, "Lord, please protect us and all of the things we are borrowing from you." It touches my heart each time I hear it. He is learning profound truths very early in life about the vanity of laying up treasures on earth. So thankful for your visit and kind words, my friend. Reading about how you grew up was almost like reading my own story. Remember, I am the baby out of eight so there were always plenty of mouths to feed. 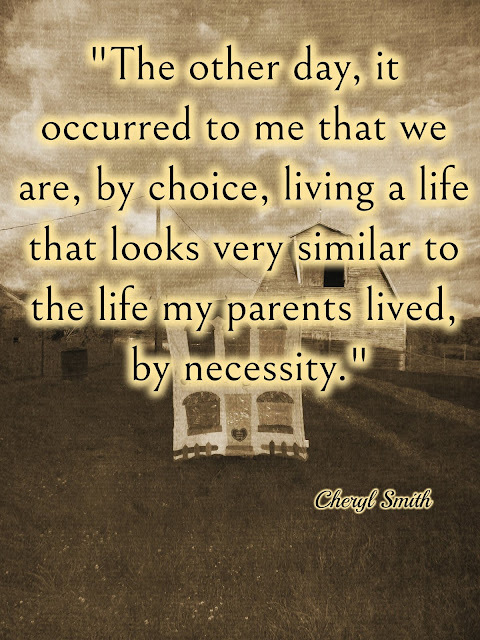 My parents and older brothers and sisters lived in rented small houses. My dad was the sole breadwinner, working as a tool maker and little on the side working on just about anything that was broken. In 1948 Dad built the house that became my one and only childhood home...I call it a "homemade house" because my dad cut every corner he could and home inspectors weren't like they are today...it would have never passed! There was only one car...Mom never learned to drive. Like your mom, she took such good care of her home and her family. We always had a big garden and hand-me downs...especially me since I was the tail end! We went to the County Health Department to get our teeth checked when necessary (only) and for our shots. Looking back on the way I was raised, I wouldn't have wanted it any other way because it was a blessed life! We may have been in "want" but we never were in "need". Thank you for this wise post...a wonderful reminder of what is truly important in life. HUGS! Oh, I loved reading about your growing up years, Debby. What an interesting, precious childhood you had! Those dear memories will stay with you forever. I am so thankful you shared about them with us here. Thank you so much for your visit, my friend. Thank you, sweet friend. I am so thankful you shared all of this with us here. Such memories you have of your own dear parents. We will never forget them or stop missing them once they are gone. It hurts to think of them no longer being here on earth with us, but one day, we know we have the hope of meeting them again where there will be no more parting. Sending much love to you and trusting God to hold you ever close. Thank you so much for your kind words of encouragement. Love you. Cheryl we grew up poor too. There many days we only had pinto beans for dinner. When we could afford real meat my mother would buy kidneys and mix them with pinto beans and tomato sauce and call it chili. We were grateful for the food we got though we didn't always like what was cooked. Your words made me think of my days coming home from school and seeing our kitchen windows steamed up and knowing Mom had a pot of pinto beans on the stove. Pinto beans, fried potatoes, and cornbread is still my favorite meal in the world. It's funny how those things become some of our fondest memories of all. Thank you for sharing, Regina. God bless you. I enjoyed reading this so much! God bless you!